Sole Choice, in Portsmouth, has been a supporter of the effort providing storage space at no cost. Operation Grace has collected shelves of shampoo and other hygiene items as well as clothing, shoes and even blankets. Dan Palmer with Operation Grace sorts through a box of donations that will go out to area kids who have been impacted by the heroin epidemic. In a time when the opiate epidemic has shaken the community, Operation Grace helps alleviate the burden on children by helping them to meet basic needs. Dan Palmer with the Scioto-Lawrence Solid Waste District explained that he first started the effort when working with Scioto County Juvenile Court Judge Alan Lemons in an effort to give heroin presentations in schools. The presentations started at East schools. While at the school, Palmer said he met with a boy who said that he gets the Steven A. Hunter Powerpaks, which provide backpacks of food for many area children; however, this kid was asking for other basic needs. After speaking with area school professionals, Palmer found that many kids in local schools go without deodorant, toothpaste, toothbrushes, clean laundry, adequate clothing, shampoo and even soap. As a result, Palmer started collecting all new donated items last spring. He has now managed to fill an entire room house at Sole Choice in Portsmouth with everything from tampons to tennis shoes. 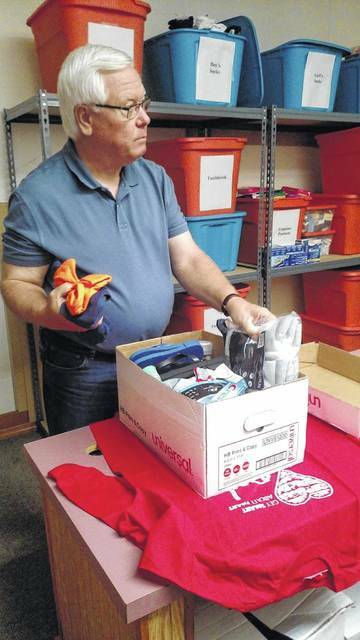 “The community has been so generous,” Palmer stated. He has had donations from various private donors, couples raising their grandchildren because of the epidemic, Evangelist Calvin Ray Evans and businesses such as Southern Ohio Medical Center (SOMC). Sole Choice also donates the space for storage of the items. Palmer explained that he has already started making deliveries. He has been working with local schools in getting their needs met while also contributing items to the courts and the 14th Street Community Center. Palmer has a form that school officials can fill out and turn back in reporting their needs. Operation Grace is also continuing to provide heroin presentations. They are currently scheduled to present at Clay, Green, Northwest, Portsmouth, West Portsmouth and Portsmouth East. Presentations will take place throughout September and October. Schools and community organizations in need of Operation Grace’s services are encouraged to reach at to Palmer at (740) 532-1231.